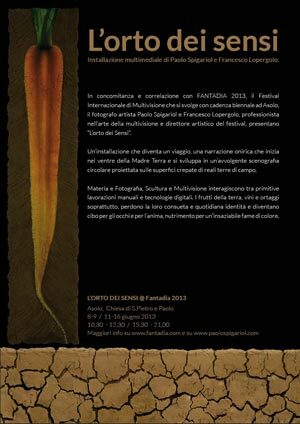 The idea takes shape in 2013 as an experimental multi-objective project to be presented at Asolo (TV) on the occasion of “Fantadia” – International Multivision Festival in collaboration with Francesco Lopergolo. “The vegetable garden of the senses”, in this first version, presents itself as a dynamic interpretation of the Ortho-Grafie and of all their philosophy, replacing the photographic print on earth with the projection on earth. 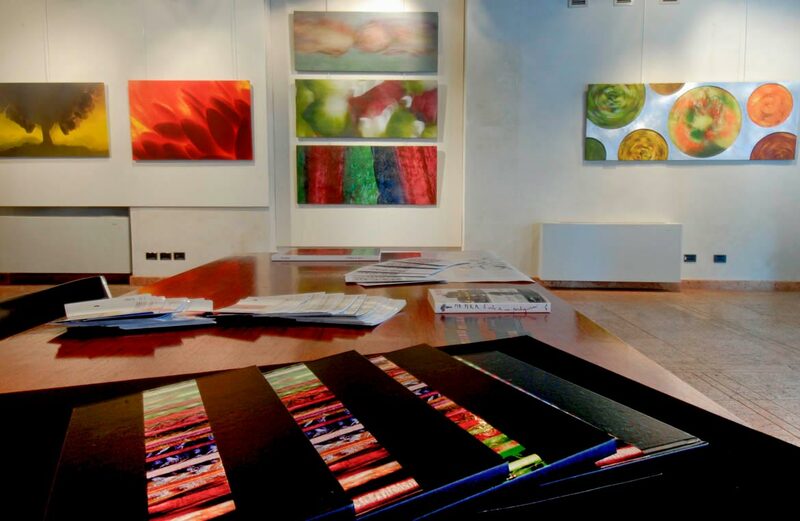 From the experience of Asolo “L’orto dei sensi” has grown and matured to become a concept. A work in progress, modular and multimedia, which presents itself as a configurable and interpretable artistic installation in one or more sequential paths. An experimental approach that blends conceptual and material, developed on the synergy between the expressive power of photography and the material force of sculpture, between the dynamism and the emotional impact of multivisionive narration and the surprising pleasure of tactile, olfactory and gustatory contaminations. “The orchard of the senses” proposes itself as “dynamic synaesthetic sculpture”. In his interpretation of reference, a tribute to the Italian agro-food excellences, he foresees a succession course divided into 3 segments dedicated to the Earth and its fruits, to the alchemies of the kitchen and to the seduction of flavors. I can not define it as an installation, but the desire to set up my first exhibition in an unconventional manner was absolutely clear to me. This is borne out by the pair of authentic fields that I have laid out, with considerable difficulty, given the concern of those responsible, on the floor of Ca ‘dei Carraresi. A section of the garden with a spade, rake, watering can and some Ortho-Grafie laid directly on the ground instead of hanging on the walls. It was 2006 and I was not aware of it, but that vegetable garden, symbolic and in some ways also real, was marking the beginning of a journey that some years later would have led me to conceive a true multimedia and sensorial installation, “L’orto of the senses “. However, even some sensory tracks were already present. A tactile approach in addition to the visual one … many have even bent down to touch the ground, perhaps incredulous that such a poor material could enter such prestigious premises. And a gustatory contamination, proposed during the vernissage as an integral part of the exhibition, a non-random parallel between the colored circles of the work “rotating soups” and those of centrifuges of vegetables and fruit, to be tasted in ice glasses. 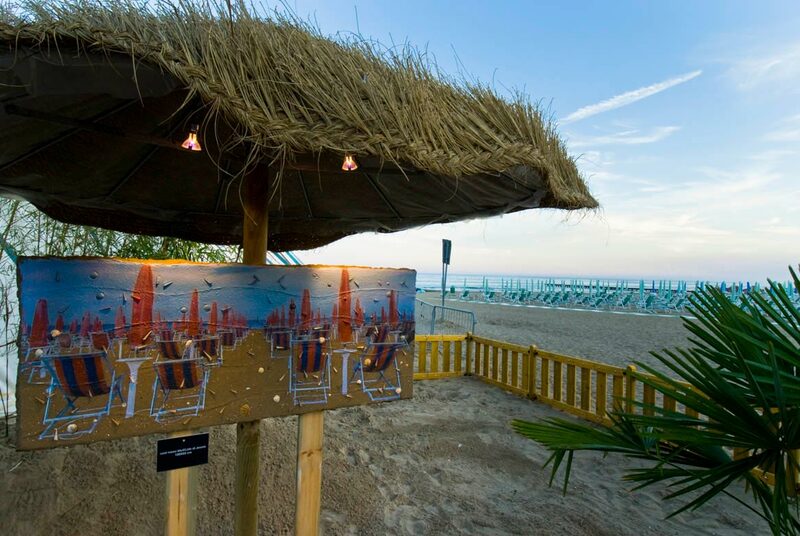 Not even this is to be considered a real installation, but the Lido-Grafie exhibition that I set up on the Jesolo coast in the summer of 2007, had a very special flavor. Taste of the sea without a doubt, and sunscreen, since I strongly wanted to position the beach, a few meters from the water’s edge. A courageous choice to exhibit outdoors for a couple of months in a location characterized by very prohibitive environmental conditions. Artistic choice meditated the use of umbrellas as an integral and coherent element, with support functions and, although minimal, of protective coverage. Attack the salty air of sea breezes and lashed by a violent summer storm, cooked by the sun and moistened by the moon, dusty from the sand and drenched in the rain. Despite everything they have resisted well and have come out substantially unharmed, perhaps …. a little ‘tanned! 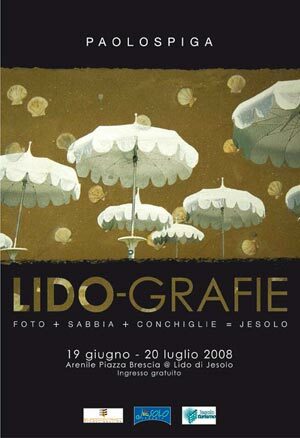 As a tribute to Lido di Jesolo, I called “Lido-Grafie” the 14 exhibited orthographs, all made with authentic sea sand and shells collected by me on that same beach, a material expression of as many images taken from the photographic book “Jesolo” – Vianello Edizioni, published in January of the same year on behalf of the Municipality. it was only a matter of testing the qualitative yield on such a particular medium. The approach was convincing and the large space of a deconsecrated church of S.Peter and Paul in the center of Asolo was the ideal situation to conceive the installation that we would then have slowly configured. “The garden of the senses”, this is the title I had chosen, was about to be presented for the first time in what I today call “version 1”. 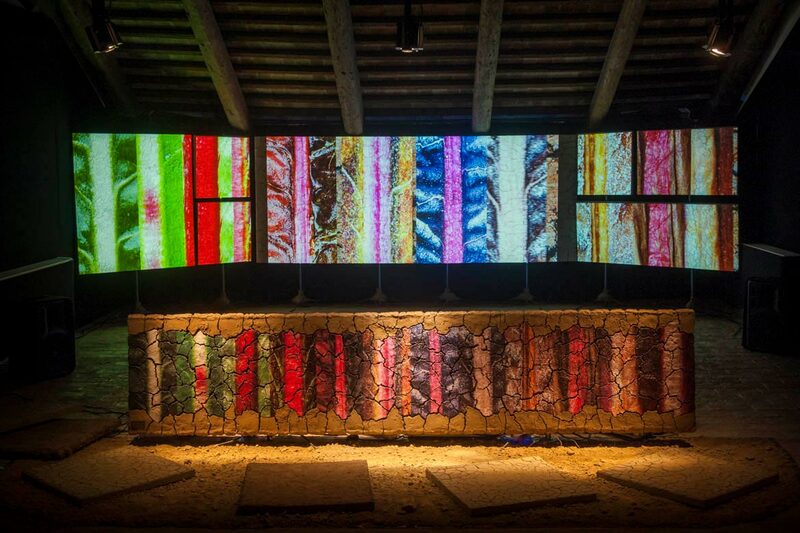 A configuration with 7 projectors, of which 6 addressed to as many groups of panels of cracked earth for a total of 24, and one oriented and shaped towards a large white canvas that descended from the arch of the altar. The installation was completed with the insertion of a dozen orchards-Grafie, individually lit in synchrony with the unfolding of the multivision, by appropriately arranged spotlights. A show of about 8 minutes from the almost mystical evanescent mood, a sensation certainly facilitated by the architecture of the location, but also stimulated by the slow pace of the dissolvenze and the particular notes of the songs by Arvo Part and … ..
the location designated for a new interpretation of my multimedia project, in this juncture also become fully multisensory. A path designed in 5 rooms, first the multivision in the attic and then the room dedicated to the Earth, the one to vegetables, the third to Prosecco and finally the last to taste and food, both of these last with guided tasting. In all I have included, with different methods of approach, the sensory contaminations induced by perfumes created ad hoc by the perfumer and “nose” Roberto Dario … scent of earth, carrot, cherry and, with a path divided into 4 olfactory agreements to smell in as many glasses fixed on artistic pedestals, also that of Prosecco. For each room a qualified tutor accompanied the visitors, the land to Roberto Cipresso expert in terroir, Valentina Spigariol who joins me in this path told the vegetable gardens dedicated to vegetables, Laura Thomas AIS sommelier welcomed in the Prosecco room and Teresa Perissinotto / Roberto Robazza for Accademia Italiana della Cucina they told about food and flavors with a focus on Polenta Corn Biancoperla. The reception in the multivision room – set up in collaboration with Francesco Lopergolo – was managed by Cristina Scattolin and the undersigned, qualifying the presentation by Rita Scartoni – Fratelli Alinari. 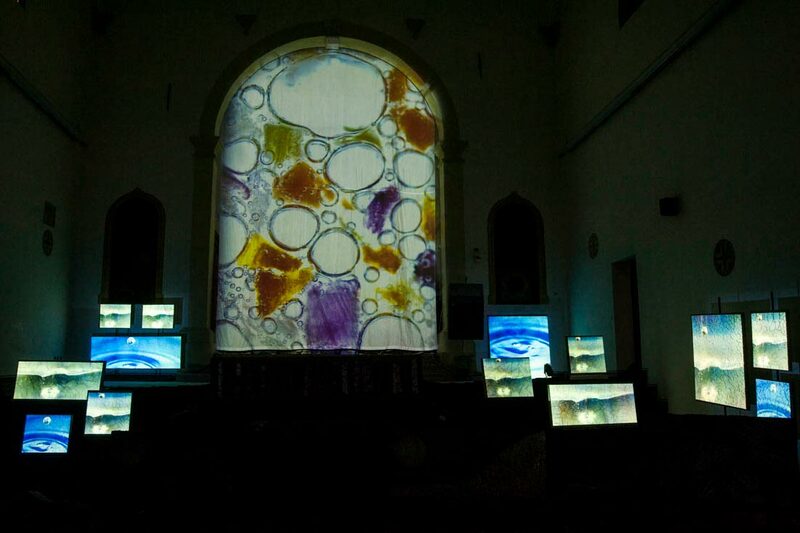 Two multimedia sections, in the attic a land screen approximately 7 x 1.25 meters long, managed with 3 projectors, completed with some Orto-Grafie illuminated in sync by a series of spotlights and, in the Prosecco room, a large monitor with “Dreamy Prosecco” multivision loop.